The antenna communicates to the Amana® brand DigiSmart suite of devices via an encrypted 2.4 Ghz signal. The large LED display and color-coded temperature controls provide easy controls for guest comfort. The occupancy sensor is a combination door-switch and room motion sensor. 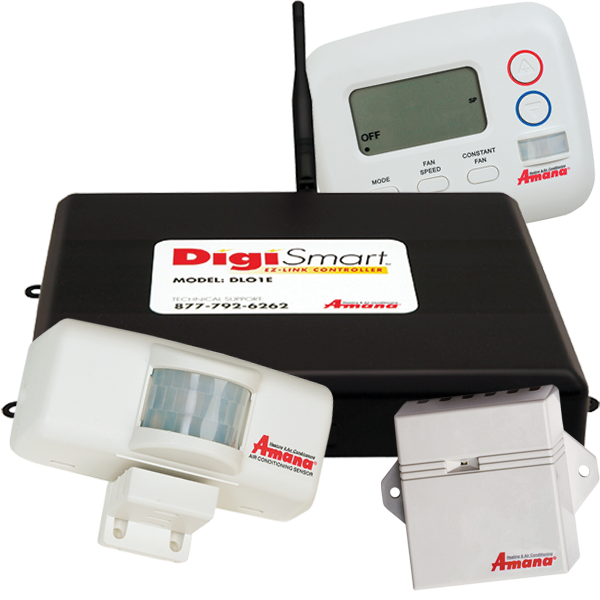 The controller communicates via antenna to each Amana brand DigiSmart PTAC equipped with a gateway antenna. True occupancy detection via the wireless door switch and occupancy sensor ensures guest comfort while the room is occupied and energy savings when not. Comfort assurance as the unit returns to the temperature set point when a room becomes occupied. Auto heat ensures that when in heating mode the heat strip is engaged if the compressor cannot meet the guest comfort level request. Total fan control allows the guest to select fan speed and continuous or non-continuous fan operation for their comfort. Optional BacNet control functionality can be achieved using a third-party BAS (Building Automation System).